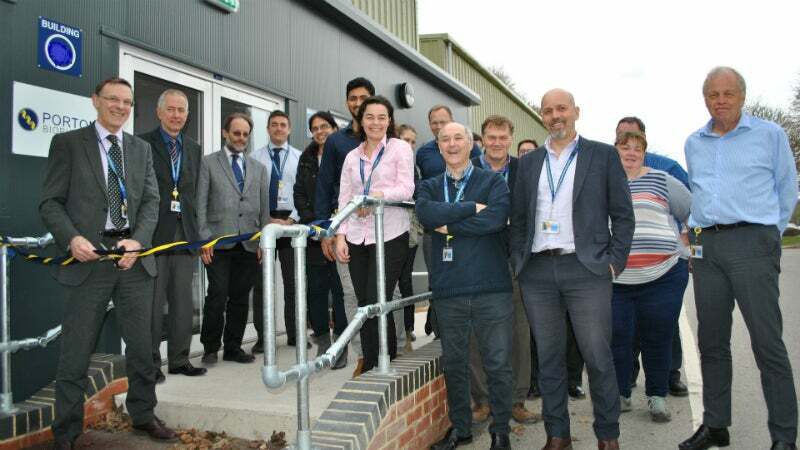 In a ribbon cutting ceremony Dr Peter Hughes, Director of Quality at Porton Biopharma (PBL) has opened a brand new suite of office accommodation to bring together members of quality assurance (QA) and other departments into one integrated set of buildings. The new 280m2 facility will accommodate approximately 65 staff and have a mix of open-plan office space and meeting rooms, along with kitchenette facilities and storage arranged over two floors. The new building will also connect to the existing Archive building, which manages the safe and secure deposition of all the records associated with biopharmaceutical manufacture. Commenting on the opening, Dr Hughes said "Some people tend to think of pharmaceutical manufacturing only being performed by scientists or operators working in production facilities. However, QA is a critical aspect in ensuring that all the systems and processes are in place to enable us to demonstrate that our work is performed to the very highest standards to ensure the safety and efficacy of our products and for us to sell our life-saving products in the world-wide market." Dr Roger Hinton MD of PBL responded that "I know that the team are really looking forward to moving in to this modern purpose-built suite of offices which will better enable them to undertake their vital roles. "The new facilities will enable the team to efficiently work together in a single location and is yet a further example of the investment that PBL is making in order to be a leading life-science company and providing high value jobs in the local community". The building has taken six months to construct. It was designed to fit in with the existing surroundings, will provide comfortable environment for the staff, and features a number of modern environmentally friendly systems such as heat recovery pumps and grey water collection capacity.